Cutting across party lines, the ruling Congress in Punjab and the Opposition Shiromani Akali Dal today refused to accept the Rs 10 hike in the minimum support price (MSP) for paddy. Various kisan unions also joined in the protest. Describing it as the first step towards second green revolution Mr Amarinder Singh, Chief Minister, Punjab inaugurated the temporary perishable cargo centre by flagging off the first consignment of two containers of fresh vegetables of FieldFresh Foods Private to the United Kingdom at the international airport here today. The first meeting of the state Environment Council held here on Wednesday under the chairmanship of the Punjab Chief Minister, Capt Amarinder Singh, emphasised the need for evolving a multi-pronged strategy to tackle problems related to the mismanagement of solid waste and water pollution, excessive use of fertilisers and pesticides, mishandling of hazardous wastes and the burning of crop residue by farmers in the fields. The Punjab Chief Minister, Capt Amarinder Singh, today assured a delegation from Canada that he would ask the Union Ministry for External Affairs to take up the matter of fraudulent matrimonial cases of Punjabi NRIs settled in Canada and elsewhere. The Punjab State Electricity Board (PSEB) is in the process of raising Rs 2,000 crore loan from the Power Finance Corporation (PFC) for implementing the much delayed Shahpur kandi project. 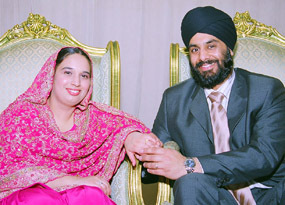 Bikramjit Kaur, US-based daughter of Gajinder Singh, one of India’s 20 most-wanted terrorists currently living in Pakistan, will get married with Gurpreet Singh at Sikh Missionary Society, Southhall, England, tomorrow. Central as well as state intelligence agencies have alerted the government authorities with regard to radical elements in Punjab. The top brass of the police has been informed how religious and other occasions are being used by these people for getting together. From constable to multi-millionaire non-resident Indian (NRI), it has been a long journey for a philanthropist, Mr Lajpat Rai Mungar. Despite having achieved what many can only dream of, he still has not forgotten his humble beginning. The Punjab Government’s notification regarding the hunting of wild boars and blue bulls is being used in violation of Wild Life Preservation Act. As per the Act the hunted or culled wild animals are a state property. The youth wing of the BJP today took out a “baraat” (marriage procession) of Chief Minister Amarinder Singh to highlight miseries of the public. However, most of the participants were aged above 35. Tension prevailed for about two hours here after heated arguments were exchanged between SAD (A) president Simranjit Singh Mann and members of a group led by SAD (B) patron Sant Ajit Singh when the SAD (B) workers prevented Mr Mann to address the gathering at a dharna jointly staged by them to press their demand to get release 28 truck operators in different cases. Rejecting outright what he described as a thesis built around the Kanishka tragedy by Iqbal Ramoowalia in his latest novel “The Midair Frown”, the president of the Shiromani Akali Dal (Amritsar), Mr Simranjit Singh Mann, said today that Sikhs were not involved in that dastardly act in any manner. Hundreds of residents of Dharam Nagari and Panjpeer colony today sat on dharna inside the Nehru Memorial Civil Hospital for more than two hours refusing to accept the body of Gurpreet Singh (15) from the mortuary. The Cabinet Minister, Mr Surinder Singla, who took charge of the Health and Family Welfare portfolio today, has directed the authorities concerned to give him feedback immediately with regard to the performance of service providers appointed to provide health services in the rural areas. In the absence of a local radio station, the people here are forced to listen to Lahore radio which has been vociferous in its campaign for spreading vicious propaganda against India. The only library of the Barnala Municipal Committee is housed in a building declared unsafe by the PWD long ago. The municipal authorities, however, are yet to wake up to reality and take any remedial steps in this regard. On the occasion of martyrdom day of Shaheed Udham Singh, Mr S.R. Ladhar, Deputy Commissioner, today announced a local holiday on July 31 in Sangrur district. On a call of nation-wide strike, employees of local banks held rally near Ram Lila ground in support their demands here. Bibi Joginder Kaur Tohra, widow of former SGPC chief late Gurcharan Singh Tohra, was taken seriously ill late last evening. She was admitted to the ICU unit of the Government Rajindra Hospital. Members of the Sanchar Nigam Executive Association yesterday held a demonstration here in support of their demands. A large number of employees of PSEB technical services of the district today staged protest carrying black flag against the member of distribution of the PSEB, J.S. Sekhon, outside the canal rest house here demanding withdrawal of the Electricity Act 2003. The Chief Minister, Capt Amarinder Singh, will inaugurate the Morinda bypass built at a cost of Rs 42.19 crore on August 1, said the Tourism and Animal Husbandry Minister, Jagmohan Kang, here today. The special narcotic cell, Punjab, yesterday arrested a key member of an inter-state drug mafia gang, Tarlok Singh, alias ‘T’ uncle, a resident of Rajouri Garden, Delhi. The body of Gurpreet Singh alias Gopi was found from shrubs near the boundary wall inside the sub-divisional administrative and courts complex here yesterday. The police have arrested two more persons accused in the case pertaining to the assault on Mohindra college Principal, Mr D.I.S. Brar. A Phillaur police team, headed by DSP Gursharandeep Singh Grewal, nabbed two members of a gang of robbers and seized Rs 78,000,180 gm of gold ornaments and $3000 from them last night. A 25-KV transformer has been stolen from the Lalru area. The Additional Superintending Engineer of the Lalru Division, in his complaint to the police, alleged that the transformer was stolen from Habatpur village, near here. Counselling for colleges of education in Punjab will begin from August 10. The Rotary Club, Fatehgarh Sahib, on Thursday organised a lecture for students of Government Elementary School, Saidpura. The All-India Council for Technical Education (AICTE) has sanctioned 30 seats each to two courses run by the Swami Parmanand College of Engineering at Jaula Kalan, near here.